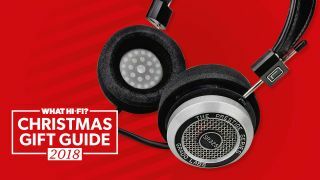 9 best Christmas gift ideas for audiophiles | What Hi-Fi? Audiophiles. That's all of us, right? You probably know someone who isn't just into music – they're really into music. And, almost as importantly, they're into how it sounds. If you're a regular reader of What Hi-Fi?, then this is definitely you, and for everyone else, it really should be you. After all, if you enjoy music, why wouldn't you want to ensure you're hearing it at its very best? And that, ultimately, is what it's all about. We think Qobuz is the most advanced streaming system. It's not for everyone but it is for audiophiles. It has an expansive streaming library of hi-res music, class-leading CD-quality sound, and an impressively broad level of support across multiple devices. Qobuz offers streaming and downloads, and this gift card allows you to give access to either option. Three months access to the HiFi plan for £59.97 is a decent gift in our books. If you'd rather give something a bit more physical, then how about jumping on the vinyl bandwagon and getting a vinyl subscription? Flying Vinyl is one of the best we've checked out and it offers a choice of 3-month, 6-month and 12-month subscription gifts, starting from £57. Your box promises the finest new indie, alternative and rock tracks, exclusively pressed with full A/B sides and custom-designed artwork. You also get an info booklet on the featured artists, plus the promise of occasional special gifts. If you're really taking sound (almost too) seriously, then you're quite happy sacrificing form and function. It's probably fair to say Grado headphones are a case in point. The style is divisive - although we think they look quite smart - and they don't do anything except play music; there's no wireless here. They also leak sound something rotten, so they're a little anti-social. But if all you want is superb sound, for under £300, there's simply nothing better. If you want to help someone take their listening to the next level, then a DAC is one way to go. Slip this Mojo in between your source and your speakers or headphones and you're sure to get an uplift in audio quality. The Chord Mojo was an Award-winner once again this year and delivers excellent audio quality, with the added bonus of plenty of connections. Who better to get some music recommendations from than your favourite artists?This new book sees BBC Radio 6 presenter Matt Everitt sharing the first musical memories of 40 of some of the world's most loved musicians. Interviewees include Alice Cooper, Brian Wilson, Dave Grohl, David Gilmour, John Lydon, Michael Stipe, Neneh Cherry, Pete Townshend, Rod Stewart, Sinead O'Connor, Terry Hall, Yoko Ono and many more. Each interview comes with a bespoke playlist so you can listen along as you read. For the ultimate audiophile, the ultimate turntable? The Rega Planar 3 has dominated the turntable market for years thanks to various upgrades and improvements, and if you want a serious record player to do a vinyl collection justice, look no further. Well made and nicely finished, the deck delivers a detailed, dynamic sound. For most turntables, you'll need to either connect them to the 'phono' connection on an amplifier or, if your amp or system doesn't have a phono connection, you'll need to add a separate box. Such as this one. So if you're thinking of buying someone a deck, you may well need to consider a phono stage, too. The Arcam rPhono has been a favourite of ours for some time, is compatible with MM or MC cartridges, and will help your system deliver a refined, entertaining sound. If someone's been very good this year, you could really push the boat out with this complete wireless music system. It may look like a pair of speakers, but these clever KEFs house amplification, wireless streaming smarts, Tidal and Spotify integration, USB and RCA connections, and support for hi-res audio. Available in a range of very natty finishes, most crucially the KEF LSX system delivers class-leading sound for a system of this size and design.